Since 1986, Fred Roggin has been the top sports anchor for L.A.’s KNBC (Channel 4). He also hosts “Sunday Night Sports”, a fifteen minute sports wrap-up show. Unique features of his sports reports, “Roggin’s Heros” and “The Hall of Shame”, resulted in a weekly nationally syndicated series titled “Roggin's Heroes”. In 1997-98, he co-hosted the daily one-hour syndicated talk show, “Arthel & Fred”. Phoenix-born Roggin joined the KNBC-TV lineup as a weekend anchor and reporter in 1980. He began his broadcast career in 1976 at KIKO Radio in Globe, Arizona. In 1978, he was seen on both KVUE-TV (Austin, TX) and KPNX-TV (Phoenix), before moving to KNBC in December of 1980. 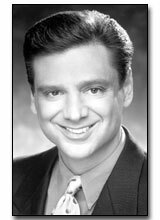 In 1990, Roggin was voted “Best Sportscaster” in the Los Angeles Daily News “Dream Team” reader's poll. He was also named “California Sportscaster of the Year” in 1990 by the National Association of Sports Broadcasters. Fred is recipient of eight regional Emmys and numerous Press Club awards including: Best Sports Series, Best Sports Special, and Best Sports Reporting. He also won the Golden Mike Award for Best Sports Segment six times.